Gain high-value exposure and prominent recognition for your company, products and services through one of our sponsorship packages. Complement your exhibit booth or sponsorship package and help your company or brand make a bold statement to stand out from the crowd. Promote your company or product (or drive traffic to your booth) with a cling advertisement prominently displayed along the escalator walls for all to see. Promote your company or product (or drive traffic to your booth) prominently in the exhibit hall foyer area for all to see. Promote your company or product with a full-color banner advertisement placed prominently in the meeting space area for all to see. 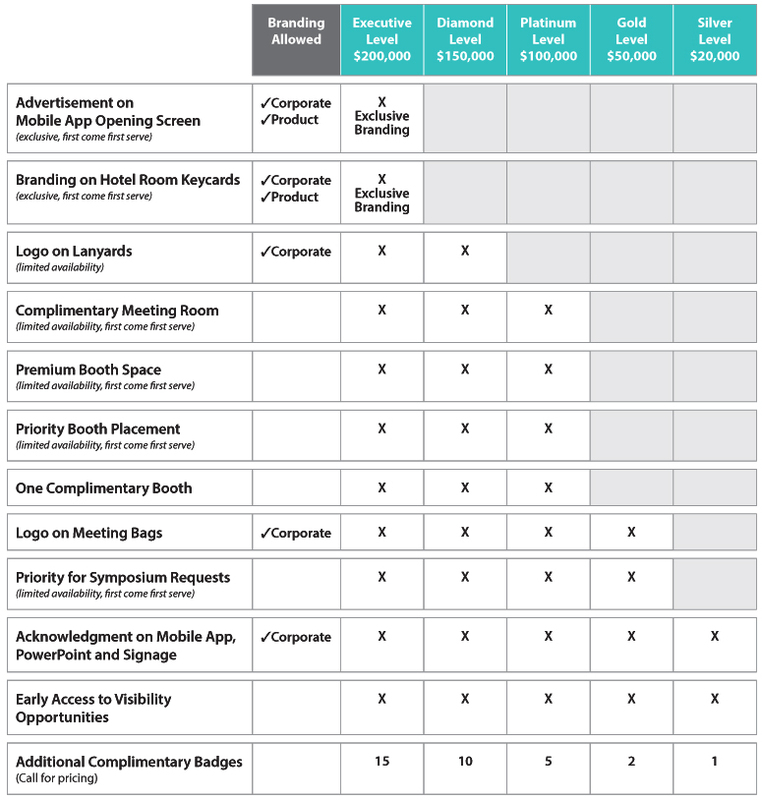 Promote your company or product on a column for all attendees to see as they enter and exit the meeting space. Promote your company or product on the charging station (able to charge 4 devices at once!) placed in the meeting area for convenient attendee usage. Have your company or product brochure/flyer delivered to each attendee’s hotel room at the official meeting hotel. Promote your company or product on signage placed next to antibacterial stations in the meeting space – attendees shake a lot of hands and will appreciate this benefit! Promote your company with a full-color advertisement on the outside back cover of the notebooks given to all attendees at check-in (always a hot commodity!). Promote your company or product with a full-color advertisement on a vibrant display screen displayed in the meeting area for all to see. Promote your company or product on the meeting’s official mobile app. Banner ads will rotate at the top of the screen that users see while using the app. Ad clicks will drive traffic to your exhibit booth or company/product website. Promote your company on the pens given to all attendees at check-in (always a hot commodity!). Place your company or product brochure/flyer in the official meeting bag given to all attendees so they can carry their materials. Enhance your exhibit listing with a company logo, 100-word description and document upload in the meeting app used by all attendees. Call us and we’ll work with you to find a sponsorship opportunity that both supports your goals and the benefits the meeting attendees. We’ve worked on many custom projects at the request of a client, so don’t hesitate to ask!